The Quindío wax palm is the World’s largest palm. Found in montane forests of the Andes it can grow up to 60 metres tall. It is a ‘diecious species’ which means trees are either male or female, which are identified by the flowers of the individual palm. Globally the species is listed as Vulnerable, but an assessment of the conservation status of the species has not been updated since 1998. However, in Colombia, the species is listed as Endangered in 2005 – which is probably more accurate assessment of the species as patterns of decline are thought to be similar in both countries. The species is the national tree and emblem of Colombia, where it is found in the coffee growing region of Quindío. Traditionally, the young leaves were used during ‘Semana Santa’ or Holy Week – an important cultural festival. However, recently a ban has been introduced to stop the practice due to the large quantities collected, which had reached a commercial scale. The tree is also used to make fencing, beams and walls of houses across its range. The wax was used for making candles and matches until the middle of the 19th Century. The extraction of the wax often involved felling the trees. In Peru, adult trees are still exploited for wax, which are often combined with material to make components for torches and lighting. In 1998, the removal of adult trees for ornamental use in Colombia wasn’t uncommon and was thought of as a threat to the species. Nowadays, its population is threatened by the intensive deforestation for conversion to pasture as well as disease. Although Colombian legislation forbids the logging of this species, large parts of the remaining population are found in extensive pastures as mature individuals incapable of reproduce in these deforested landscapes where grazing is intensive. Bernal, R., and Sanín, M. (2013). 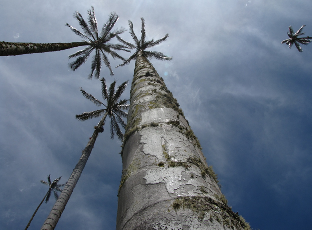 Los palmares de Ceroxylon quindiuense (Arecaceae) en el Valle de Cocora, Quindío. Colombia Forestal, 16(1), 67-79.